Find the best attractions in Bermuda listed here. You definitely don't want to miss out on visiting these places. Consult with our guide before planning your trip and you can't go wrong! Best underwater tour company in Bermuda! Think outside the Bermuda Snorkeling Box and book an underwater tour with Hartley's Helmet Diving! While your head stays completely dry, you'll be walking the ocean bed, interacting with tropical fish and sea life up close and personal! Helmet diving is one of the safest ways to explore Bermuda's beautiful ocean, as there is no regulator or snorkel stuffed into your mouth! You breath completely normal inside the helmet and simply walk along the ocean floor taking in the spectacular sights, which include fish, coral reefs, eels, octopus, lobsters, shrimp, anemones and more! The dive takes about 30 - 40 minutes and the entire trip is about 3 hours - depending on how many divers are on the excursion. 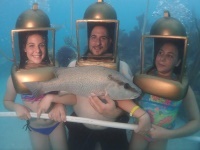 Best of all, the entire family can participate in the dive! Helmet diving is so safe, it is a recommended activity for anyone over the age of 5! The primary aim of Hartley's Helmet Diving is to give divers an inspiring, educational, entertaining and safe underwater experience! Call 866-836-3989 (Toll Free) or email hartley@logic.bm to discuss booking, availability and pricing. The next time you're vising Bermuda - Hartley's Helmet Diving should be the #1 destination on your vacation agenda!